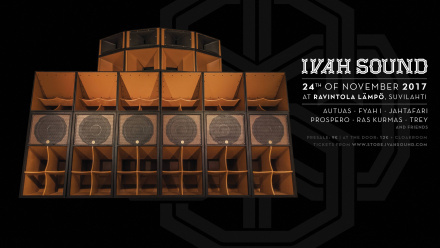 Ivah Sound System has been spreading sound system culture both near and far for years. As one of Finland’s most prominent sound systems and bearers of bass music and sound system culture, they now present you a new dimension of sound system design: a custom designed & hand built, fully modular true sub-bass system; operated by the full crew for the first time. Come and experience the full spectrum of sounds; from dub to jungle in a true Ivah Sound way! PALEFACE • PAPA ZAI and more. ➤ Presale tickets 9€ - Limited amount sold. Ivah Sound System’s new iconic sound system was hand built in the first quarter of 2017. Designed and constructed in the south of Finland, it’s truly a unique system. Featuring new speaker designs never used before and hand crafted out of the finest birch wood by the crew themselves. Incorporating the wonderful finnish nature and forming it into a sound system. The music Ivah Sound plays comes from the roots of sound system culture. Bass music with a conscious message; dub and jungle is what they love. Special dubplates together with singers and players of instruments, Ivah Sound shows are always full of energy. At this session all the members of the Ivah Sound family will play both together and as solo artists; taking you all on an uplifting musical journey. Ivah Sound - Taking sound system culture forward in Finland and beyond!